It’s another family Sunday and most of us were anticipating another afternoon of family fun and good food after church. 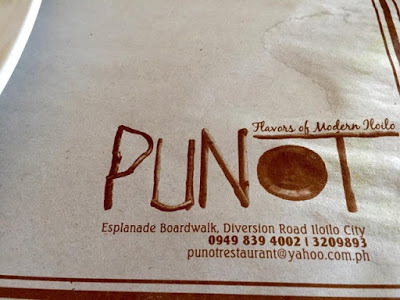 This time, our family decided to have lunch at Punot, a seafood and Ilonggo restaurant located along Esplanade Boardwalk, Diversion Road, Iloilo City. 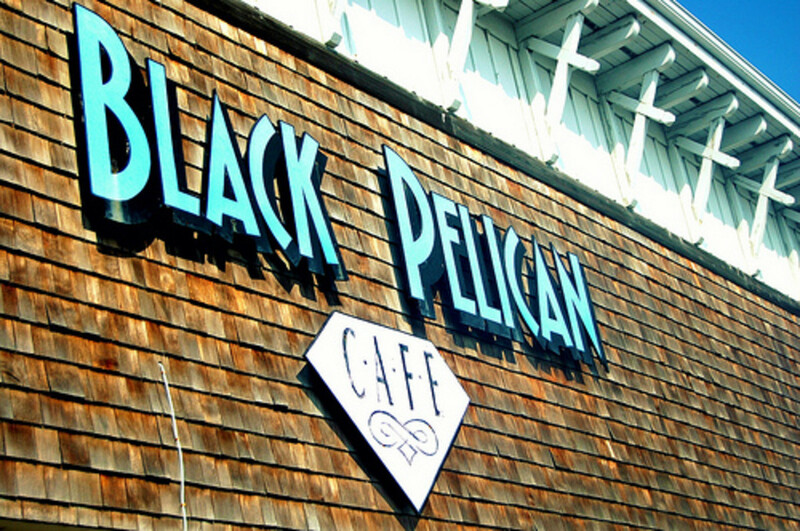 Prior to our visit, I have already seen a travel show featuring the food in this restaurant. I have to admit, the food looked rather appetizing and it got me really curious and excited so we didn’t spend much considering other places at this time. If you want to try this restaurant, it’s quite easy to get there. From SM City, one of the largest malls in Iloilo City, drive out of the mall’s driveway to Diversion Rd. and go towards the direction of the Iloilo River but make sure to turn right onto Donato Pison Ave. At the roundabout, take the third exit to Pacencia T. Pison Ave. and just follow the street until you reach the parking area of Smallville. 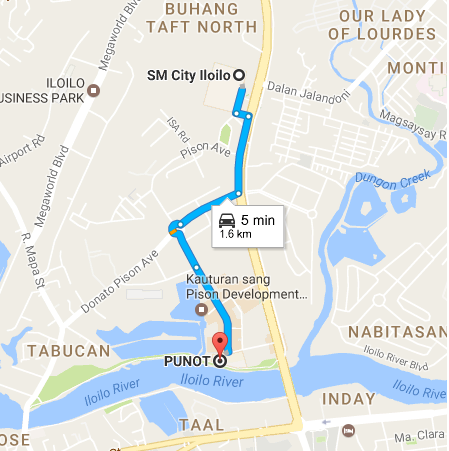 You’ll find yourself in front of Punot after approximately a five minute drive, about 1.6 kilometers. 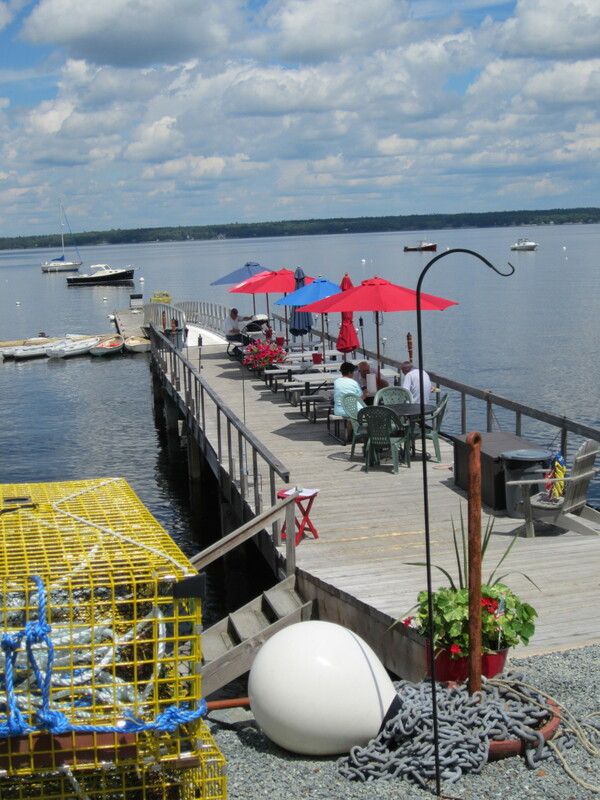 It is one of the restaurants situated along Boardwalk. 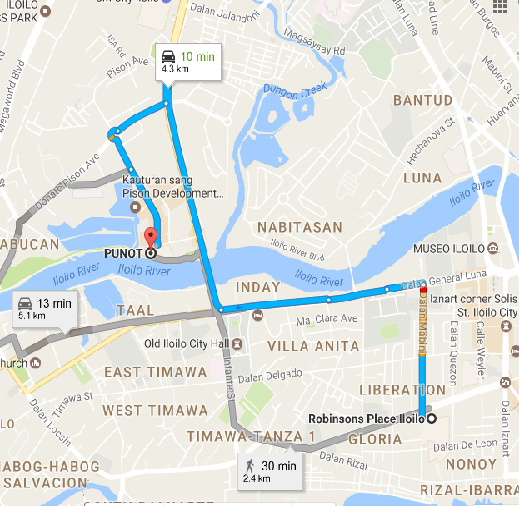 If you will be coming from the city proper, let us say Robinsons Mall, the fastest way would be a 10-minute, about 4.3 kilometers, drive. From the mall, take Mabini St then turn left onto General Luna St. Upon reaching the bridge, turn right towards Diversion Rd. Drive straight for about 1.2 kilometers, make a U-turn then turn right onto Donato Pison Ave. The rest of the direction is the same as given above. I, together with my husband and my mom-in-law, were the first ones to arrive at the place. I liked the ambiance and the consistency of the native decors to the theme of the restaurant. 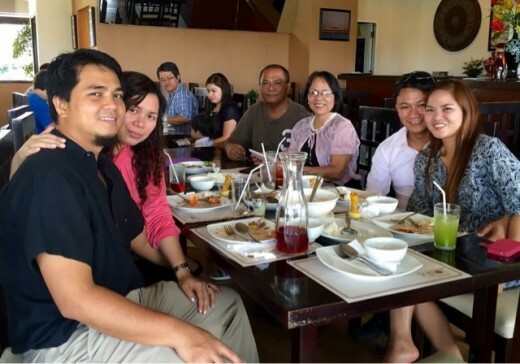 Most tables were occupied on the ground level so we continued to the second level and took the secluded table near the terrace door overlooking the Iloilo River for a more relaxed and private atmosphere. Already famished as the church service ended late, we didn’t waste any more time and started ordering food. 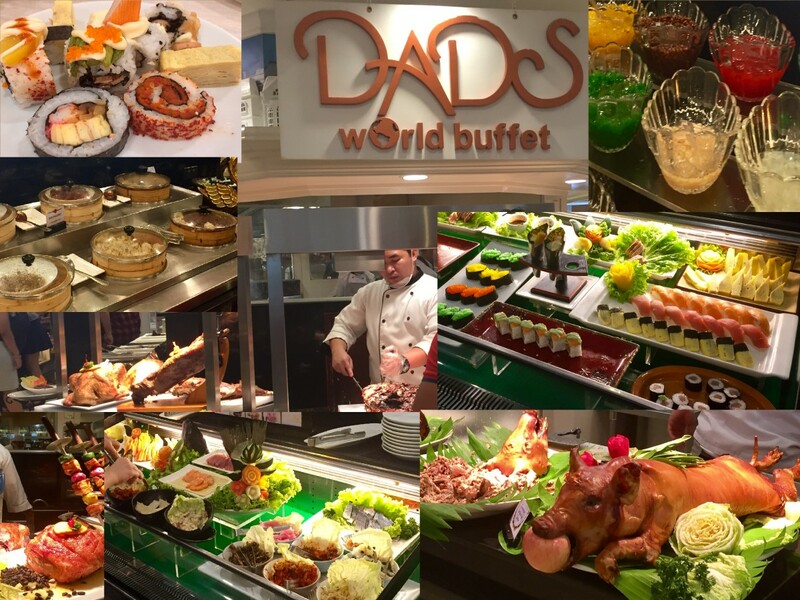 We had some questions on the menu and the staff were very friendly and happily answered our queries, demonstrating familiarity of the food they offer. Approximately twenty minutes later, just in time as the rest of the family members come in, the waiter started bringing out our food. 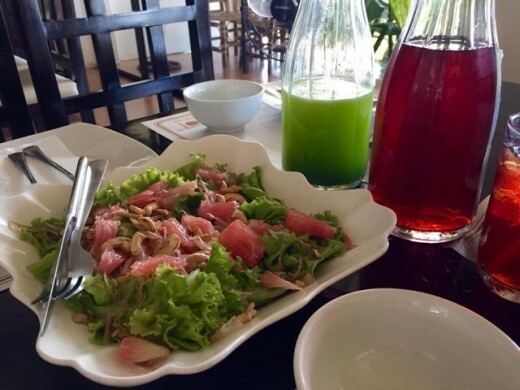 First to be served was the Pomelo Balingon Green Salad with cashew nuts and vinaigrette (See main photo above). 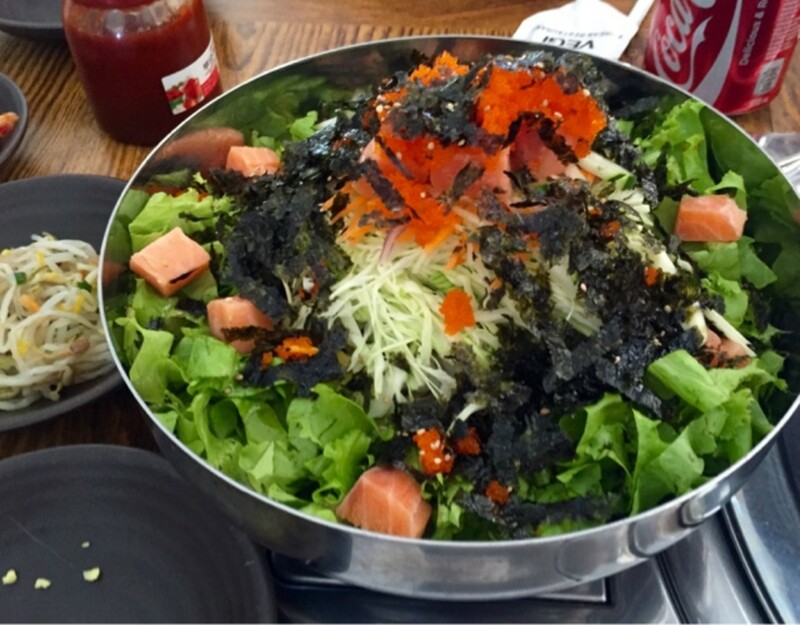 The lettuce leaves were healthy green and the combination of its ingredients was perfect. 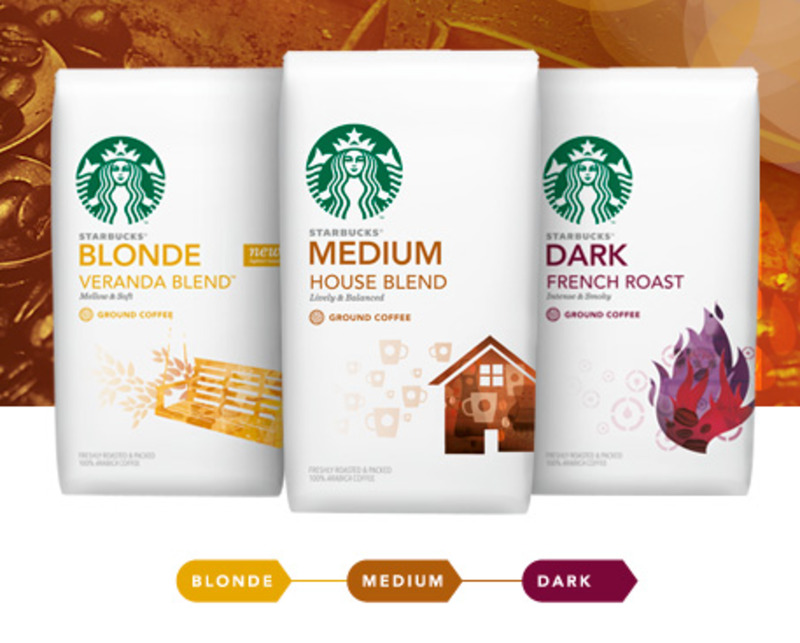 The presentation with all its colors was pleasing to the eyes. 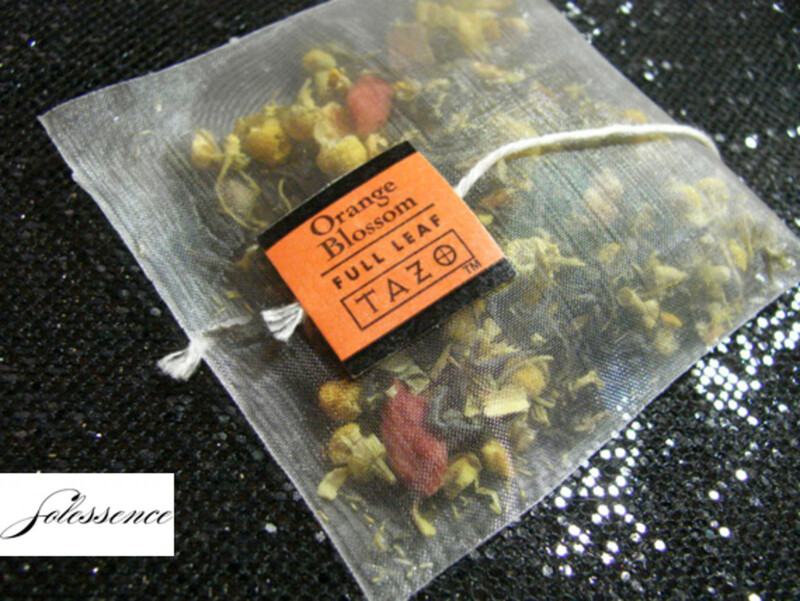 The taste was a balanced burst of fresh, sour, nutty and salty. I liked it very much I would order this whenever I get the chance. Ten more minutes of chitchat while enjoying the salad appetizer and the rest of the food started coming out of the kitchen. With rice, we ordered Seafood ala Punot. 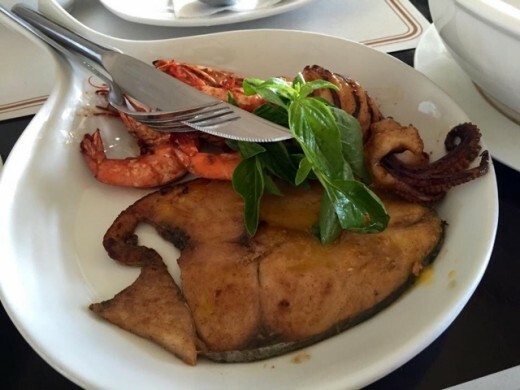 This offered various seafood; fish, squid and shrimp, marinated and grilled with lemon butter sauce. I preferred for the fish meat to have retained more of its juices with generous serving of lemon butter sauce. This was a tad bit of a disappointment and didn’t really stand out for me. 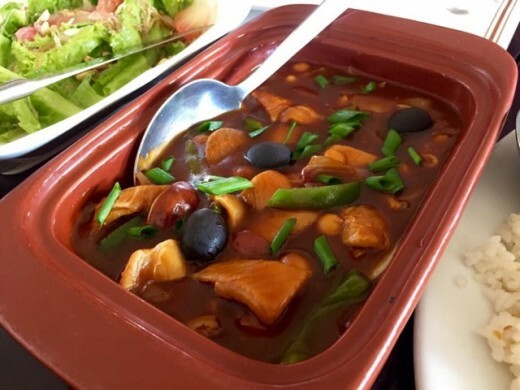 Next to arrive was the hot and delightful Chicken Stew with Pegion Peas aka Kadios similarly cooked like Ilonggo's KBL (kadios, baboy, langka) garnished with green pepper. This was the husband’s favorite. 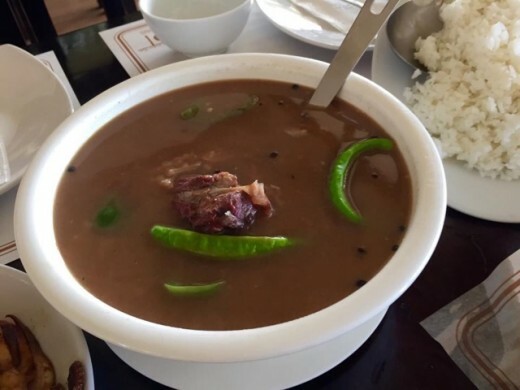 This stew was really comforting and reminded us of home in the province, just served in a restaurant-y way. We also had the delish Callos ni Erving. This was a dish of tender tripe cut into strips and cooked with olives, sausages and native tomatoes. Every bite was so flavorful especially with the olives and the tripe was so tender, I can’t get enough. This was everybody’s favorite. We had another dish of seafood, the Sizzling Indong. 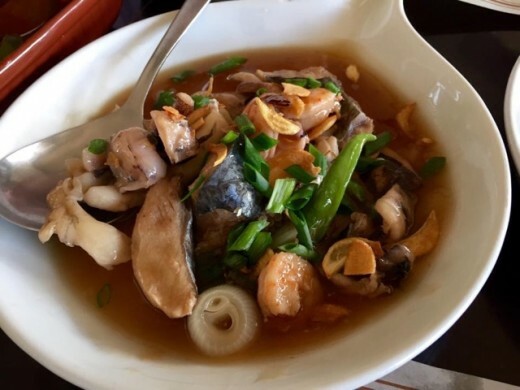 It offered cutlets of eel and other seafood sautéed in chilies and different spices. This dish didn’t really stand out for me and I also didn’t notice anyone from the family liking it very much. Safe to say the other dishes over-powered it that it became forgettable and didn’t leave a lasting impression. 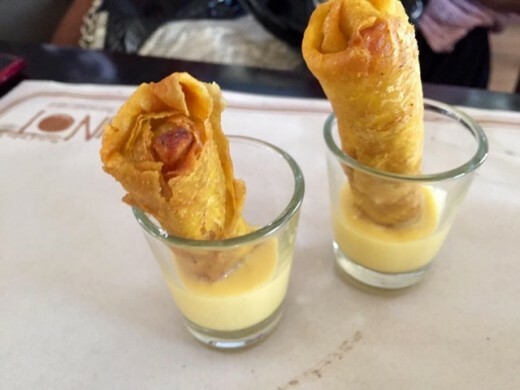 For dessert, we had Turon Sticks, a combination of banana and jackfruit wrapped and fried to perfection, served with a special sweet sauce. And to go with our food, we order Red Iced Tea and Cucumber Calamansi Juice, both were very good and refreshing. Punot’s presentation and plating was overall wonderful. It was like eating out from a food magazine, all pleasant to the eyes. Additionally, the servings of most dishes were for 2-3 people. Punot was clean, relaxing and unwavering to its native Ilonggo theme. The service crew were smiling, welcoming and offered great service. The preparation and wait time were satisfactory given the freshness, presentation and taste of the food served. And for all of it, we paid around Php2,400. Considering the cost, Punot can be considered as a place to cater to middle to upper middle classes who can afford to pay for good ambiance, great food and excellent service. Punot was a great place hence deserving of a high score. However, my 5 Stars is still on reserved as there were still areas of improvement when it comes to the place and the food. 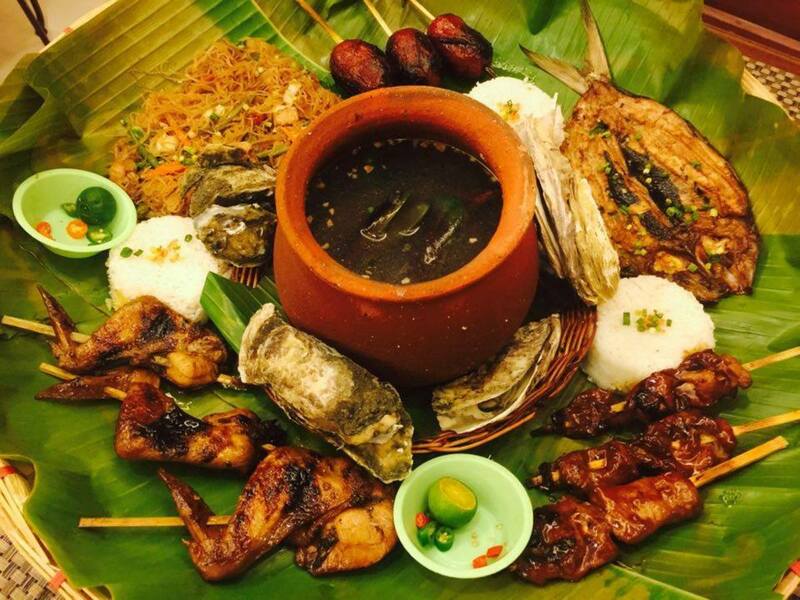 No doubt though, Punot is definitely one of the most promising restaurants Iloilo City should be proud of having.